When people hear the word patches, the first thing that comes to mind is a small piece of fabric on top of another fabric. In a way, that is true. Patches are made from small pieces of fabric. Another idea when people hear the word patch is that it is a badge of achievement and membership. This is especially true among boy scouts and men in the army. For boy scouts, they have patches made as a badge of achievement such as survival patches, civil service patches and so on. One can see the accumulated patches arranged on their vests or sashes as proof of their success. For military men, patches serve as an indicator of the special unit they belong to. 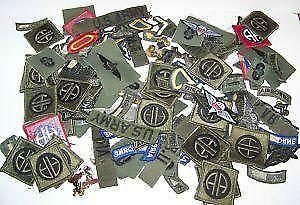 By the late 80s and 90s, patches had become fashion must haves for teenagers. These patches would depict their favorite sports team, pop culture icons and even cultural fandoms such as Star Trek and KISS. Most patches were made either by embroidery or stamped on. And they were attached either by Velcro or by iron on backing. The most popular patches are iron on patches, due to its ability to have the patch attached seamlessly on the medium. And it’s quite easy to attach because it requires a simple iron. The patch is laid on the garment and then covered with a thin, damp towel. Then the iron is placed on the towel for half a minute to attach the patch to the fabric. Believe it or not, iron on patches can double as giveaways and even collectibles. So where can we get these patches? We specialize in creating customized patches for people who like to show their achievements in a very subtle manner. We make them in minimum orders of 10 pieces and so on. Having custom iron on patches made is quite easy. Just follow our simple steps. The first step is design. A custom patch won’t really be a custom patch if it wasn’t made uniquely. Patch designs can be made either by sketching or in fully rendered looks. They can even be an amalgamation of two icons. Whatever the design, what makes the patch is what it means to the user. The second step is choosing the embroidery. Our package allows seven free colored threads. Afterwards, we give them free control on how the embroidery is done. They can have the patch fully embroidered or partially embroidered. After all, we put the custom in customers. The next step is sizing. Because these are custom patches, they can be as big as big as cans or small as a wallet size photo. The patches can also be made in various shapes. 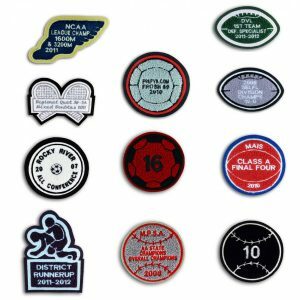 We offer our clients the choice to have the patches shaped like circles, star or even stenciled out designs. The possibilities are endless. The next step is choosing the backing. We have a wide range of patch backing to choose from. We have tape backing, which is a great choice if a person needs a quick change for their outfits; button loop backing, which allows patches to hang on either a button or a lanyard and of course iron on backing for iron on patches. The next step is to choose whether the patches have borders. These are designed to keep the threads in line as well as show a detailed and clean look. The standard border is the marrow border, which gives the patch and simple, but classic look. The other option is the hot cut edge, which gives intricately detailed patches a sharper look. We also offer additional patch options such as the use of metallic threads for those conversation starters and additional thread colors. We aim to supply our clients with varied options. The best part of our service is that we offer free costing. Once our clients are sure of their patch specifications, they simply fill up a request form with the necessary details as well as patch design. Then we receive the form, review it and immediately send it back to them with the complete cost options. This is done so that our clients can see the total cost of the design and whether or not they will opt for a different look or accept it. We want our clients to be truly satisfied with both the service we provide as well as the patches they will soon own. We believe that having custom patches such as the popular iron on patches are the best and most subtle way of showing one’s achievements in certain endeavors, membership into a prestigious organization or merely declaring their affinity for a particular culture. We guarantee complete customer satisfaction as well as excellent and high quality workmanship. There is no patch too small or too big for the job. We welcome the challenge. If you are designing any custom patches, so we help you by patches4less todesign your patches made are quite easy. Alan Jones February 16, 2017 November 22, 2017 . Categories: Handicraft. Tags: Custom Patch, Customized Patches, Iron On Patches, Patches.